We had by now entered in the state of Victoria. I’d been shooting torch bearers and nothing but torchbearers for 57 days. Each day there were over 100 torchbearers carrying the Flame. I didn’t have to shoot every one of them. But there was a system for who I should aim for. First there was a ‘feature torchbearer list’. This was a list prepared a week in advance by our media department to highlight which torchbearers were either famous or had been selected for some extraordinary story or quality. There were usually 5 or 6 names on this daily list. The list I worked from was the ‘Photo Opportunity List’. This list highlighted any special location we would be passing by or stopping at (such as riding a camel on Cable Beach, or taking the Flame underwater at Great Barrier Reef). As discussed earlier, the photo opps didn’t always work well due to bad light, not enough time, poor choice of torchbearer etc. 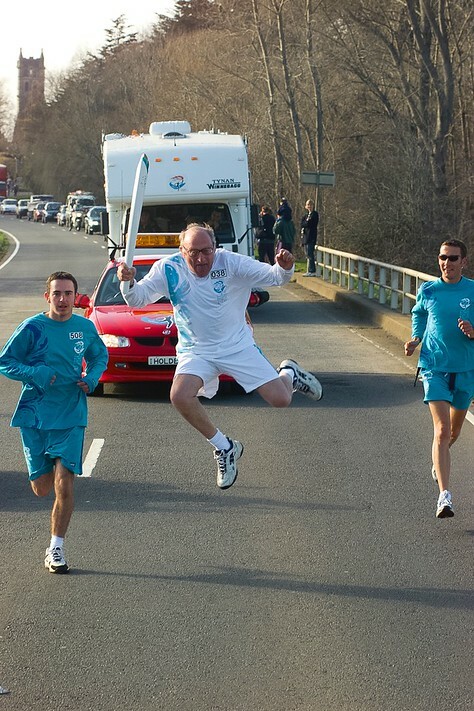 And the ‘feature torchbearer’ was not always that interesting either. But they were the must gets of each day. Everything else throughout the day was whatever I could turn into a compelling image. We then started discussing what would make a shot of a torchbearer more dynamic. Something more than what 1,000 torchbearers before them had not done. And it came to us in one word – ‘JUMP!’. Adam becomes our very first 'Jumper'. For the next 49 days we encouraged the shuttle hosts (the team that brief the torchbearers and dropped them off on the side of the road ahead of us) to tell their torchbearers to jump for the photographers and you’d get your photo in the newspapers (maybe). It certainly made our day a bit more exciting to photograph and created some dynamic photos. 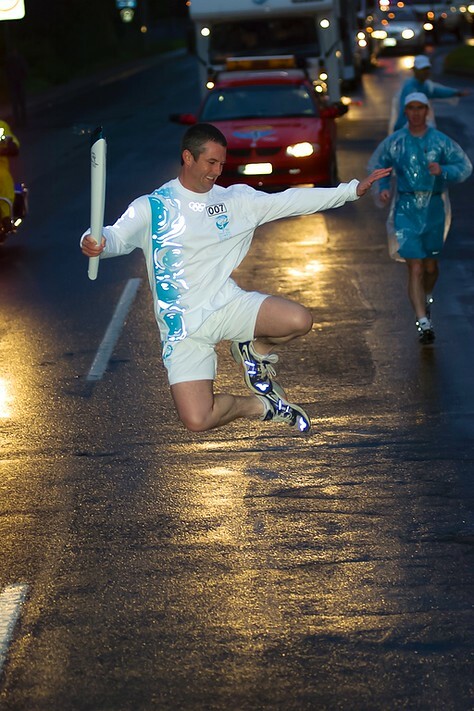 It was generally only the young ones that jumped for us – though a few older torchbearers got in on the fun too. The trick was to know to expect it. There was no point jumping if the photographers weren’t ready to capture the millisecond moment suspended in the air. So the shuttle hosts would call me and tell me which torchbearers had said they would jump. Then when they were carrying the Flame we were poised, ready to shoot. And if they were a little reluctant we’d all scream out ‘JUMP, JUMP!” and they’d go for it. And so here is a gallery dedicated solely to our ‘jumpers’.